Come get your vacation on at this charming and well appointed 3-bedroom, 3-bathroom cabin. 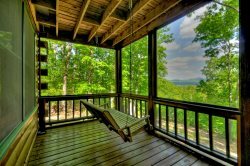 Big Ben's View has everything you need to make the most of your time in the North Georgia Mountains. From the screened in porch with an outdoor fireplace, to the game room with a pool table, you'll never run out of activities to keep everyone entertained. Upon entering Big Ben's View, you will be greeted with a view of the mountains only a prow-front home can offer. Take note of the elegant vaulted ceilings and beautiful stone gas fireplace. The kitchen is equipped with all you need for cooking your favorite meals even when you are away from home. Enjoy a muffin and some coffee at the breakfast bar, or have a family feast at the dining room table with seating for six guests. The adjacent living area has cozy furniture calling your name. After you've found your favorite seat in the house, sit back and relax in front of the fireplace while you watch your favorite shows. That is, if you can keep your eyes off the stunning mountain view. Located in Sunrock Mountain Development just 15 minutes from downtown Blue Ridge Shopping and Dining. Just got back from Blue Ridge, GA and I cant rave enough about Big Ben. The views were breathtaking, I couldnt stop taking pictures. Our group of 8 had plenty of room and the kids loved the game room on the lower level. I will say that as a Floridian who is used to flat land the ride up to the cabin was a bit scary because of how steep the road was at some points but our Hyundai Elantra made it. The cabin certainly had everything we needed and was very clean. I did have trouble finding some baking sheets but eventually found them in the drawer under the oven. We also lost power for quite a few hours but it seems to have been the whole town so not much anyone could have done. All in all we had an amazing trip and I hope to visit Big Ben again next year! The cabins have been beautiful and seem well maintained. The ease of booking and the staff I interacted with were knowable and professional, and friendly. Beautiful but there are two small area rugs that are very dangerous. One of our party actually fell when the one in the kitchen slid out from under them. Thank God they weren't harmed but somewhat shaken. We loved how organized the check in process was. We loved Big Bens view. The cabin and view were exactly as pictured on the website, and it is so close to everything. The cabin is very tastefully decorated and comfortable too. The pool table was a nice bonus and the kitchen was well appointed. The team was so very nice and helpful they told us where to eat and where we could go for entertainment. Our stay was wonderful, nice clean property very well decorated and nicely furnished. Your team was amazing. Every single step of the way - from email to phone conversations - were wonderful. Thank you so much for that - it made all the difference! The property was absolutely wonderful. Everything was done at a very high level. Excellent stay and we will be back for sure! Your team was incredible to work with...from the planning process, to our check-in to our departure. Everything was perfect. I loved how much information your team provided me at check-in. There was so much to see and do in the Blue Ridge area, and their attention to making sure I was comfortable with my surroundings made the adventure much more enjoyable. Big Ben's View was everything your website promised it would be! Everything you listed about the property was 100% accurate and exceeded our expectations. It met every aspect of our needs and was beyond our expectations from the second we walked in the door. Well appointed with everything we could have possibly needed!The house was incredibly clean upon our arrival and it immediately felt like home away from home. I loved reading all of the positive comments and stories of family vacations and special occasions in the guest register book as their mirrored our experiences! We're already planning our next visit this Fall and will be telling all of our friends to book their next mountain vacation with Southern Comfort Cabin Rentals! We had a very peaceful and relaxing family vacation with fun adventures. Beautiful home, excellent customer service! Will be back!! Within short driving distance to Grand Mountain Lodge and Mile High.